When you need to get away from it all, there's no better place to go than a beautiful beach. Beaches mean a lot of different things to everyone. For some, they're a place to escape the stresses and noise of city life; for others, they're a place to have fun with family and friends, building sandcastles, eating picnics, playing games, and swimming in the sea. The United States of America is home to a very long list of beaches, with 23 of the states having some form of coastline on either the Atlantic Ocean, Pacific Ocean, or Gulf of Mexico. New Jersey is one of them. In fact, the Garden State is home to one of the most famous stretches of sandy coastline in all of America: the Jersey Shore. Known to locals simply as 'The Shore', the Jersey Shore is the main coastal region of the state of New Jersey. It runs for over 140 miles in total, stretching out from the city of Perth Amboy to Cape May Point and encompassing multiple counties. Well-known for its stunning sands, breathtaking sunsets, unique attractions, boardwalks, water parts, and more, the Jersey Shore is one of the key recreational areas for NJ and draws in many visitors from surrounding states like New York, Pennsylvania, Maryland, and Virginia, with Canadian and other international visitors also flocking to the beaches of the Jersey Shore each year to appreciate their unique beauty and attractions. With a huge stretch of coastline, there’s a long list of super beaches to be found along the Jersey Shore. The great thing about these beaches is their variety; some Jersey Shore beaches are crowded and highly popular, with lots of great, family-friendly attractions located just a short walk away from the sand, while others are calmer and quieter, offering romantic, intimate environments for couples and solo travelers to relax. Read on to learn all about the best Jersey Shore beaches. Definitely one of the most popular Jersey Shore beaches, Point Pleasant Beach is a huge hit with families thanks to the many wonderful and exciting attractions of the Point Pleasant Beach Boardwalk. This spectacular stretch of seafront is like an all-ages playground, complete with all kinds of fun things to do like an aquarium, rides, ropes course, restaurants, and more. If you're looking for a full day of family fun on the Jersey Shore, Point Pleasant Beach is a must-visit location. The Jersey Shore is well-known for its busy, bustling beaches like Point Pleasant, but if you're in the mood for something quieter and calmer, Stone Harbor isn't a bad place to go. It has a lot of great amenities and things to do, but is much more laid-back than some of the livelier Jersey Shore spots. You can find some great stores and eateries, as well as some unique activities like pottery painting and mini golf. As for the beach itself, Stone Harbor offers soft sands and gorgeous views. Best of all, it never gets noisy or crowded, so you can sit back, relax, and enjoy the sights, sounds, and smells of the ocean. Spring Lake is one of the most exclusive areas of the Jersey Shore. Lots of upscale stores and boutiques line the streets of the local area, making it a super spot to combine some fun in the sun with an exciting shopping trip. You can spend a few hours exploring the stores and then head on down to the beach to rest your tired legs with a lazy sunbathing session. As with many Jersey Shore beaches, some good quality hotels and restaurants can be enjoyed at Spring Lake too, so it's a top spot no matter what you're looking for. The best thing about Ocean City is its boardwalk. The Ocean City Boardwalk runs for nearly three miles in total and has a lot of fun things to do and places to check out. The Wonderland Pier arcade is filled with rides and games to play, while the local Castaway Cove is also a big hit with families and thrillseekers. Some excellent eateries can be found here too and Ocean City really offers the best of both worlds because you've got all those great amenities and attractions as well as almost eight miles of sandy shore to explore. 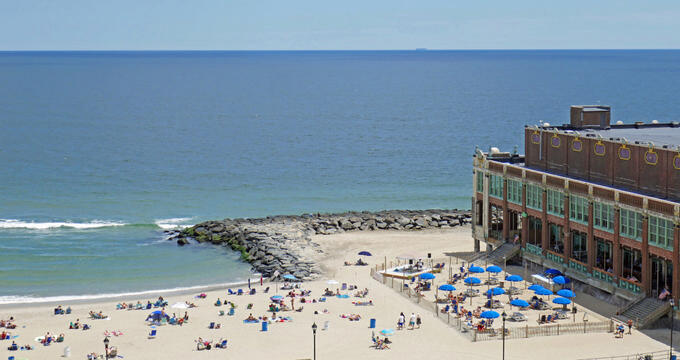 Whether you're looking for great food and excitement or a secluded spot on the sand, you'll find it at this Jersey Shore beach. Asbury Park is one of the fastest-growing areas on the Jersey Shore. Recent renovations and developments have helped this are grow into one of the shore's top spots and it's easy to see why. Asbury Park has some of the finest dining opportunities anywhere in New Jersey, with lots of lovely beachfront restaurants to try out. The beach itself is cozy and comfortable, with soft sands and gentle splashing waves. You can enjoy a lot of different beach activities here and the food is out of this world. If you're actually hoping to head out on the water and ride some waves off the Jersey Shore, Inlet Beach is the one for you. There are a few good surfing beaches on the shore, but this one really stands out for the challenging waves and exciting conditions it has to offer all-year long. Located in Manasquan, Inlet Beach is always awesome for surfing, but it can be a nice spot to simply sit on the sand and admire the views as well.